I think my life has reached a whole new level of boredom. With only one course this semester (instead of my usual four), I have had much more free time, which turns out to be both a blessing and a curse if you don't know what to do with it. To spice up my life a little, I have been partaking in some more thrilling activities, such as flossing my teeth, eating all the cookies in my cabinet, and lying in bed while staring at the ceiling. The climactic moment of my past few days was when I cleaned my desk, which made me feel so accomplished that I decided to reward myself with a sushi adventure for passing such an important milestone in my life. 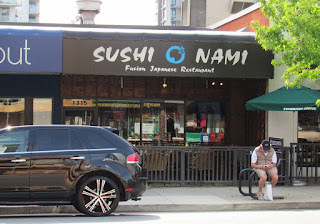 Sushi Nami is a Korean-operated fusion Japanese restaurant that is considered to be one of the fancier Japanese restaurants in North Vancouver. 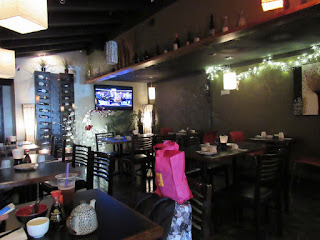 My first visit to Sushi Nami occurred way before I started my blog, and I remembered the food to be above average. 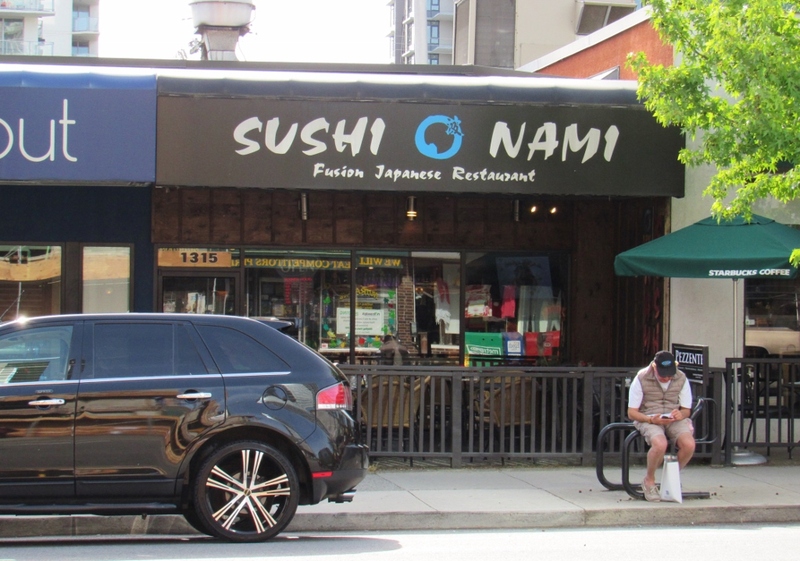 However, Sushi Nami is one of the most expensive restaurants on Lonsdale Ave., which is probably why it is not the most popular restaurant in the area. Perhaps we are paying some sort of premium to see Christmas decorations at any time of the year? 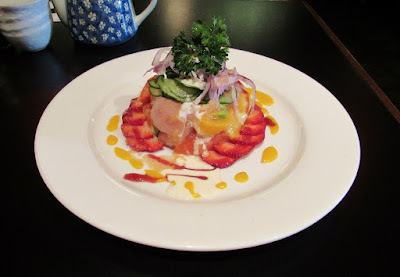 It is evident from Sushi Nami's Facebook page that the staff are quite proud of this creation. The sashimi was a mix of soft, melty tuna dressed with Japanese salad dressing along with fresh sockeye salmon. There was a decent amount of sashimi in there, which was accompanied by some red onion, strawberries, mango, and avocado along with a pile of cucumber slices. The fruits provided a refreshing side to this aesthetically pleasing salad. The Toro Tataki Nigiri was nicely prepared with juicy toro on the underside, and the light, sweet teriyaki sauce on top helped livened up the flavours. 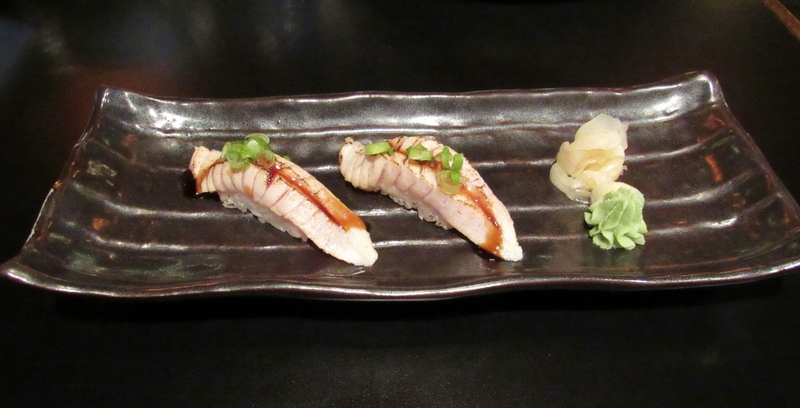 The rice formation was also above average, though the tataki would benefit from a more pronounced smoky flavour. The Ebi Mayo was a rather pricey dish ($12.95) that consisted of six deep-fried prawns accompanied by something they called "yogurt mayo sauce ice cream." If I were at an ice cream shop, the last thing I would think of ordering is "yogurt mayo sauce ice cream." 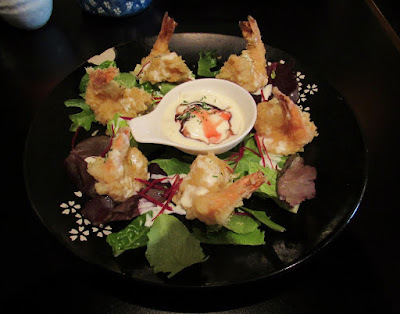 Looking past the name, the strawberry-flavoured ice cream did wonders to the plump, juicy prawns. 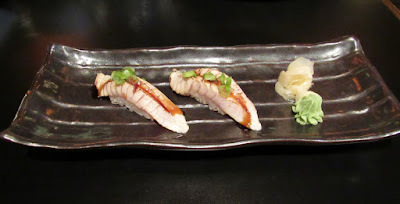 The interplay of different temperatures, textures, and flavours was just perfect. This dish was eye candy, mouth candy, and ear candy all at the same time. Wait... yeah, you get the idea. The Labster King is a baked special roll with asparagus, BBQ sockeye salmon, lobster, and avocado. I would like to think that the title contains a typo, but unless you type on a Dvorak keyboard like I do, the A and the O are nowhere near each other. In either case, the Labster King was a calorie heaven featuring a harmonious savoury flavour. There were a few sizable pieces of lobster on top of the roll as well as some additional lobster inside. A hint of sweet chili provided a slight spicy kick to the roll. The only issue I had with this roll was the overly mushy mashed yam, but in the world of sauce-heavy fusion rolls, this one ranks above average. I received friendly, attentive service throughout my visit. Just like last time, I was very pleased with the innovation, execution, and presentation of the food. If you need some eye-catching food photos for your Instagram account, you can visit this place (provided that you order their creative dishes rather than their ordinary ones). If you need a reward for cleaning your desk (like me), you can also visit this place (or maybe just have sushi in general—that will do as well). For your summer break, to help end your summer boredom, how about starting another blog such as "Raymond's Ramen Adventures"? I'm not sure if I can keep two blogs running at the same time! I only go out for ramen about twice a year (and about the same frequency for most other types of cuisines), so it would be hard for me to keep a second blog active. Thanks for the suggestion though. LOL I did do those things before, but very infrequently.